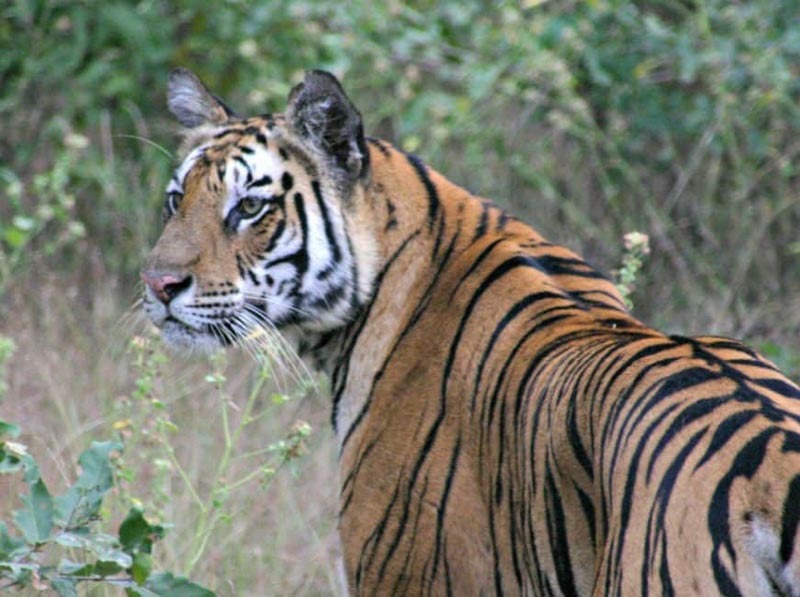 I am in search of Royal Bengal Tigers, the magnificent cat revered for centuries, feared for centuries. He has been persecuted in the name of ‘sport’, he has been coveted for the rich spoils that adorn those who defeat him. The most secretive of all the great cats, he has been worshiped as a god, as a protector, and condemned as a ruthless killer. Unlike the passages to India in olden times, I surged forth in a jet airliner, east towards the sun. Towards the land of the Maharajas, the sahibs, the Old Gods, of tea, spice and mystery. And towards the land of Bengal tigers. Countless stories have been told of his courage and strength, of his power and nobility, and also of his terrifying evil. He has been described as ‘a large-hearted gentleman’, a ‘pathetic, lame coward’, ‘a manifestation of evil’ and ‘a god of the forest and thus of the world’. Once he roamed the whole of the Asian sub-continent, but today he is found in small pockets of jungle, small places which have created the last remaining shrines to the guardian of the forest. The forest is his temple, the rich dense undergrowth, the secret places to hide, the perfect place for his solitary, shadowy existence. Passing the sun, on its daily procession west, my plane lands in the darkness. And in this darkness, I find the life of Delhi. The vibrant colours, sounds and aromas. The sacred cow wandering the messy streets. The lonely sadhus, the temples – elaborate and simple; people both rich and poor. 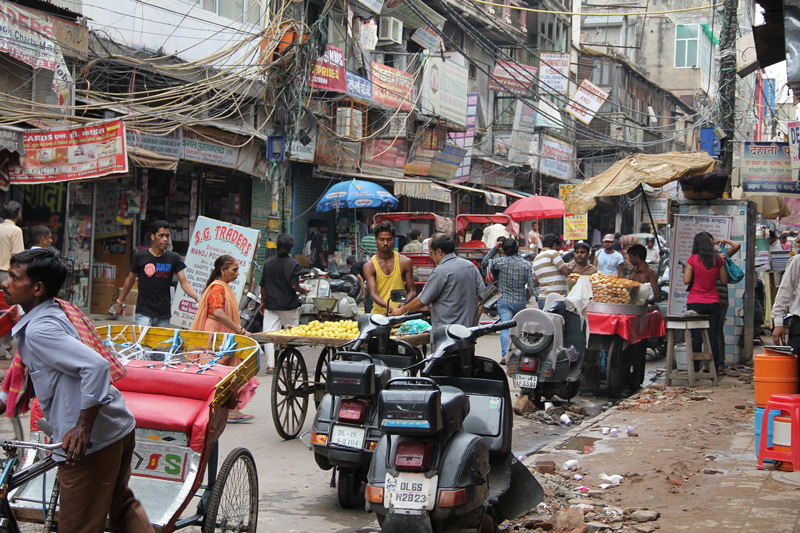 The melee of traffic, of pedestrians, of people sleeping on the streets, gossiping on corners, worshiping in shrines. Detached from this, I am ushered to the colonial residence of such well-known names as Lord Curzon and Lutyens. The white-coated waiters and the traditionally-dressed doorman welcomed me to the magic that is India. From there my train chugs south-west to the land of Kipling’s Jungle Books, in anticipation of a meeting with the big Baloo, the noble Bagheera – and the villain of the story: the dreaded Shere Khan. I watch from my train window as the shanty towns of Delhi disappear giving way to the fields of wheat and rice. The placid cows, the domestic buffalo wallowing in the shallows, the odd and misplaced nilgai – or blue bull – I felt the draw of the jungle, that tempting secret that no one can ever really know. The following day, as dawn chases the night from the forest, the jungle is real. The searing heat of the rising sun, the vivid green of the Sal; the thick, inaccessible bamboo, the lush marshland of the meadows and the bright red flame of the forest. As dew drips from the trees, I am driven by jeep to meet the elephant who will take me deep into the tiger’s domain. The towering fort on the top of the largest mountain in Bandhavgarh bears down impressively on the insignificant visitors. Formerly the mountain retreat of the Maharajah of Rewa; now a temple with the ancient statues of the incarnations of Vishnu, the Protector of the Forest. At the base of the mountain, Vishnu reclines, surrounded by a lake inhabited by frogs and fish, behind him the ancient Sanskrit engravings, describing the life of the jungle. The giant monolithic caves, carved out of bare rock by Buddhists, who once lived a meditative life here, seeing nature at it’s most real. Guests in someone else’s drawing room, finding solace in the simple lives of the beasts. Here, on elephant back, I would search for Bengal tigers. I am in his home now. He watches from his shadowy resting place, unseen. I would humbly request an audience with the King of the Jungle. The elephant, so obedient to her driver’s command, scours the dense landscape for any trace of the tiger. Silently moving through the thickets, the bamboo scratching my legs, the flame of the forest contrasting with the luminescent green of the Sal. Her long trunk removing any overhanging branches that might hurt her riders, munching her breakfast as she performs her daily chores. 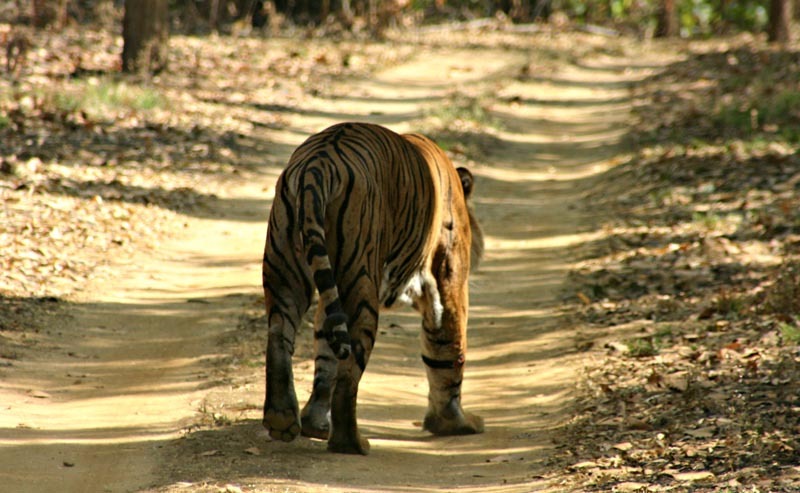 Entering the domain of the bengal tiger, contrary to an elephant’s natural instinct. See what it's like to visit an elephant sanctuary in Chiang Mai, Thailand. 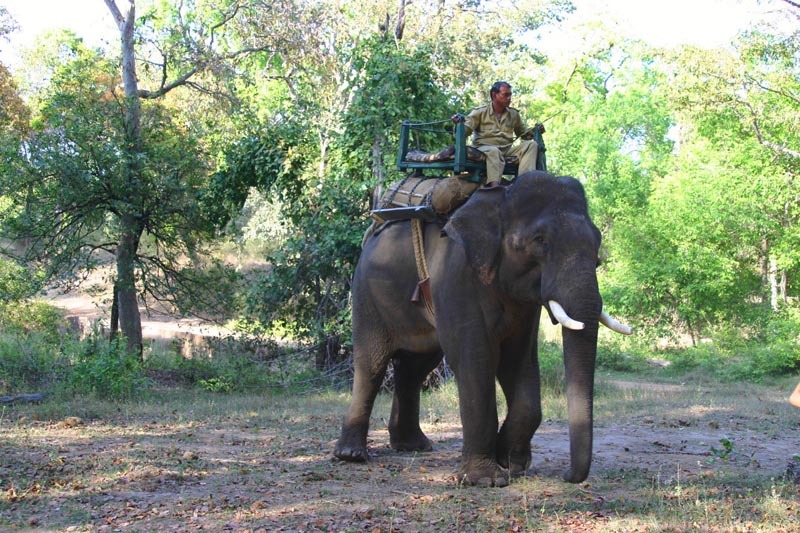 It's a miserable life for elephants having to give tourists a ride. Let's stop this practice. Suddenly I see a movement. It is him: the tiger! Slipping through the forest on his morning vigil, the huge cat glides past me, unaware of his effect on me. Silently he moves, his golden coat disappearing into the darkness. His secretive life demands that he patrol and mark his territory. He tells the world who he is, what he owns, when he passed here, and – most importantly – what will happen if he finds a trespasser. He marks his territory with urine, saliva and by scratching deep gashes on the tree-trunks with his claws. His enormous frame moves with the grace of a ballet dancer, undetected, single-minded and unconcerned. He embodies the spirit of grace and harmony. 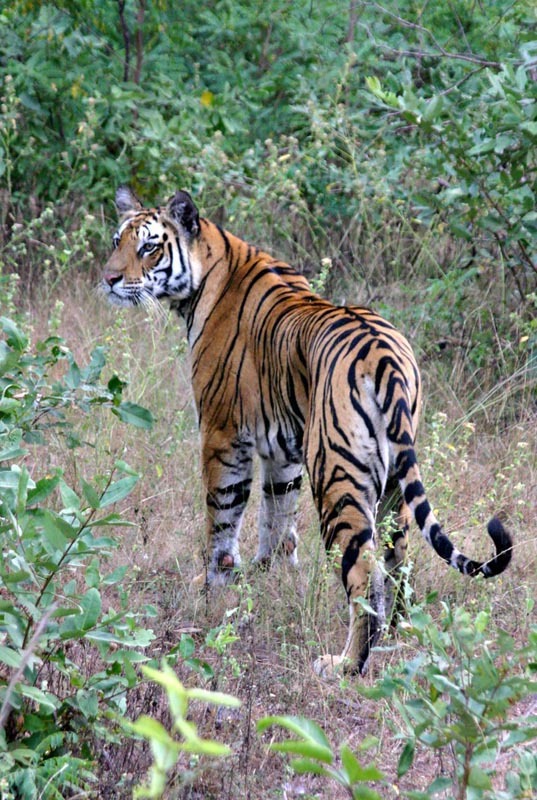 Harmony of nature, the tiger is the indicator of ecological harmony in a forest. Our fleeting glimpse of him, disappearing into the thick undergrowth, encourages me to take a different path, towards alarm-calls from the frightened residents. Monkeys bark their warning, sambar deer rush away, birds take flight. All afraid of the tiger’s presence – warning each other that the King is close. After traversing a steep and rough gorge, suddenly I find someone – less intent on his duties – prepared to give us an audience. Want more wildlife? See 20 Animal Encounters From Around the world. 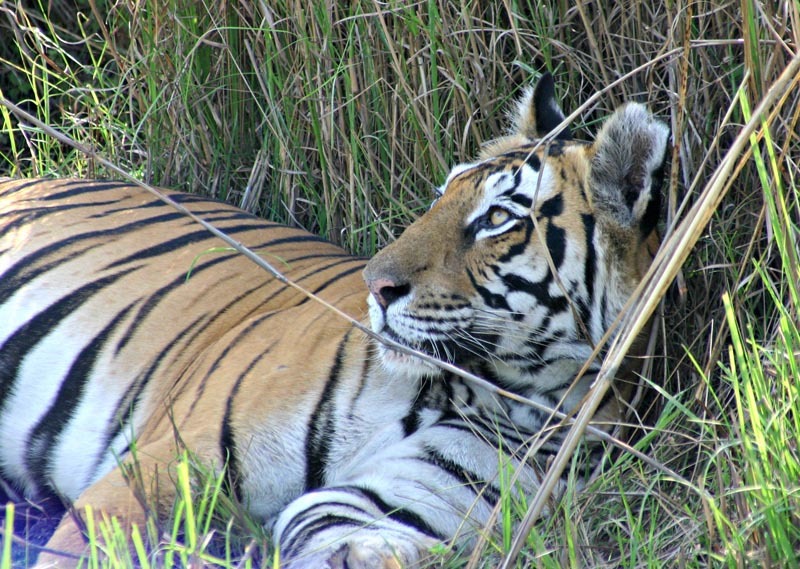 The Royal Bengal Tiger rests serenely on a rock. His bright orange coat in contrast to the black rock upon which he sleeps. Occasionally he looks my way, giving me a faint hope that perhaps he recognises me, perhaps he understands the momentous occasion that his presence offers me. To him, I am but a benevolent observer; the elephant munching noisily on the bamboo branches and grunting on his morning ritual. The King of the Jungle goes back to sleep, oblivious to the camera clicks and the excitement that surrounds his presence. Occasionally his tail flicks, and his large paws spread out in the comfort of his resting place. All too soon it is over, raising his head, he stretches and slinks back into the forest. My elephant takes me back to the very human life of the jeep that has escorted me to his jungle hideout. Check out 6 Reasons Why You Should Visit North East India. Returning to my lodge for a hearty breakfast – an easily-prepared feast that I struggle not for – I think of him. The apex predator who has the most difficult life in the jungle. The tenuous nature of the fragile forest that supports him. Every bird, every animal fears him, humans attack him, other tigers fight him. Nobody prepares his breakfast for him, nobody sees to his continued health. He is alone and contented, amidst his struggles for food and territory, ever encroached by his human neighbours. 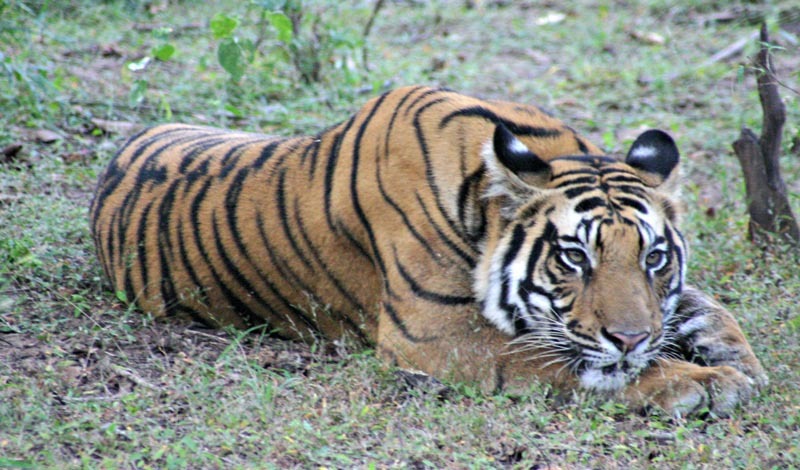 Through the tiger, the life of the forest is made real, made complete – and made into a perfection of nature. As the sun gives its life-giving force to the earth, throwing elements of darkness and light through the jungle; it is reflected back, in the golden coat shining through the black stripes of the Royal Bengal Tiger. 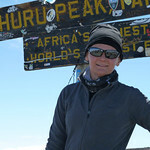 Clare has lived in Africa, Europe and now New Zealand. When not travelling the world and climbing high mountains, she writes for her blog Altitude Treks and is a little bit obsessed with Mt. Kilimanjaro! Follow Clare’s adventures on Twitter, Instagram, or Facebook. 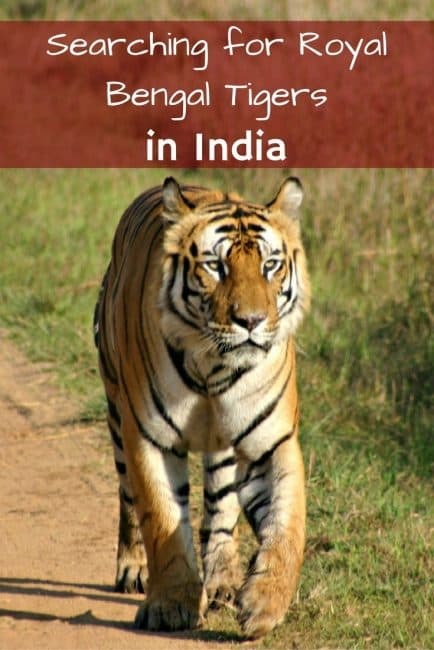 15 Responses to "In Search of the Royal Bengal Tigers of India"
Informative Article: This is one of my Favorite place in India. I really love this article. keep posting. 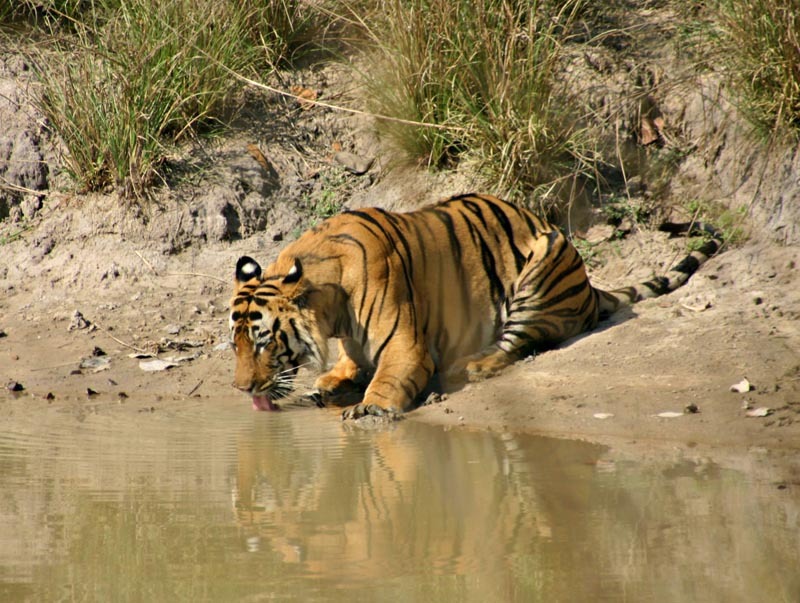 It is great to know that the largest population of Bengal Tigers are found in India. its a very great and wild creature, but their population is decreasing day by day.we should take more steps to save them. I like your obsession with Mt. Kilimanjaro. I really love reading your article and what superb photos you took. My experience with tigers was in Rishikesh (Uttarakhand) but never had a clear view of this magnificent animal (too thick of a jungle!). Nice information available in this website!! Wow nic pics, very good pics of tiger. These tigers are royals that why they need protection. Such beautiful creatures! Thanks for sharing. Wow nic pics, very good pics of tiger. These tigers are royals that why they need protection. Damn! It’s not everyday you get to see these majestic creatures. Good work with camera out there! Thanks for sharing this amazing pics of Tiger. Royal Bengal tigers are the world famous. Thank you for sharing such an amazing pics.